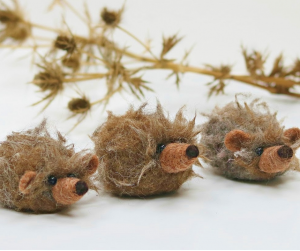 Hedgehog needle felting workshop is a new addition to 2019 and compliments the previous hugely successful workshops tutored by Sandy from Lincolnshire Fenn Crafts. Sandy is so excited to introduce Colin, her version of our beloved hedgehog and the newest member of the Lincolnshire Fenn Crafts tribe. As well as teaching you the basics of needle felting Sandy will also be teaching new needle felting techniques and, introducing new wools to create dramatic effect.